How Imelda Yong and Dr Elaine Hong found flexibility and physical relief by moving, flowing and playing with childlike wonder, at classes they teach at District 13. Certified MovNat instructors Imelda Yong and Dr Elaine Hong are bringing the healing benefits of the workout to Malaysia. 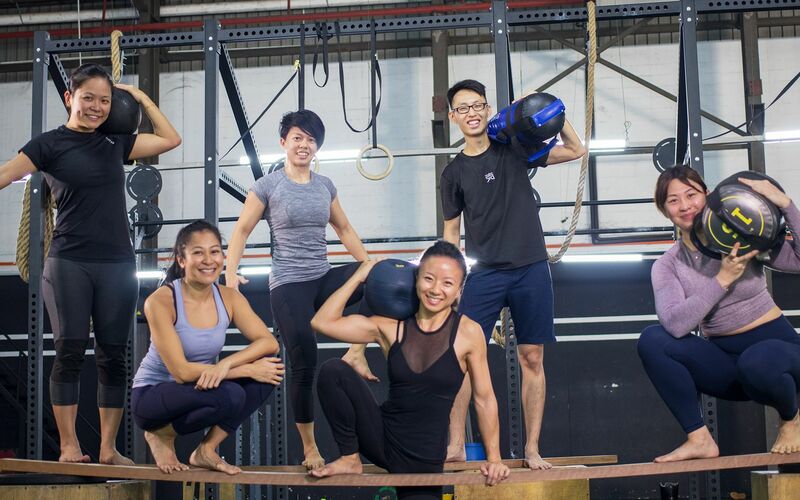 No fitness journey is alike, and the same can be said for Imelda Yong, the group marketing director of boutique consulting group, Lab Malaysia. In her pursuit for aesthetic goals, Imelda turned to high intensity workouts, which backfired in chronic injuries only made worse with a sedentary lifestyle. Physio was but a temporary relief – until she bumped into Dr Elaine Hong, who recommended the MovNat workout. The duo self-trained in the mobility-based regime dubbed MovNat, focusing on form, technique and muscle groups, Today, they are the only certified MovNat trainers in Malaysia, and for Imelda, injury-free days lie ahead. Curiosity brought us to their MovNat-inspired Natural Movement training ground at District 13, where the Imelda and Dr Elaine welcomed us to a dynamic session and explained the workout's philosophy. An adult's playground: Natural Movement engages practitioners to expand on skill performance, movements, and energy efficiency, in the safest way. How did you come upon Natural Movement? Imelda: I discovered it about a year and a half ago, when visits to physios were temporary reliefs to my injuries incurred in the process of chasing aesthetic goals; lifting heavy weights, doing HIIT, chasing personal bests. Discovering and practicing Natural Movement helped me get more mobile, which enabled better movement for everyday life. Dr Elaine: I was studying in the UK and was always interested in outdoor training. I came across an article on MovNat and did more research, but there were no practitioners who could hold or teach these classes. When I met Imelda and told her about it, she really took to it that led to a certification pursuit. What is the essence of Natural Movement? Imelda: Natural Movement is the ability to perform movements efficiently as well as focus on the skill, adaptability and practicality of the movement. Dr Elaine: Conventional training focuses on work capacity: reps, weight, speed, and caloric burn, whereas Natural Movement is about efficiency. It’s how well you perform a skill or a movement, with the least energy expenditure, in the safest way. Walk us through a typical Natural Movement training and what it covers. Dr Elaine: Warm ups start from the ground up: think of newborns on their backs, who transition from rollovers to crawls, then sitting up and eventually standing up. We then lighten things with a short game, applying the principles we want to teach them in the session. We then teach new skills; running, climbing, balancing, before we bring them to the last part, a combo session combining everything they learned into an obstacle using their new skills. We want you to move freely because the moment you stop moving, that’s when everything falls apart. Who do you recommend Natural Movement to? Imelda: Everyone, from a 6-year-old kid to an 80-year-old grandparent. We even have a client going for knee surgery, who signed for some pre- and post-operation rehab. We incorporate a lot of Natural Movement skills and drills for mobility and to strengthen certain parts that need to be strengthened.